This recipe is 4 SmartPoints per serving, 1 cup. In a medium bowl, mix together all the ingredients. Once mixed, cover the container and place in the refrigerator. Refrigerate overnight. Stir again before serving. 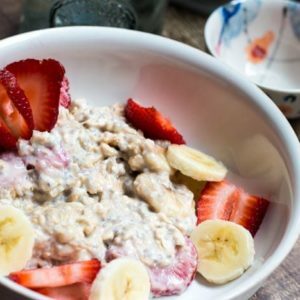 You can add additional sliced strawberries or bananas when you are serving the following morning.